Do you have children or grandchildren that are in that in between toddler and “big kid” stage? This is the perfect trampoline for you! The Skywalker 8′ Round trampoline has all the feel of the Skywalker 12′ or 15′ but the safety of a smaller enclosure. The 8′ trampoline is suitable for jumpers up to 150 lbs, and is not meant for bigger jumpers. The 8′ trampoline make assembly considerably easier compared to the likes of the larger trampolines. 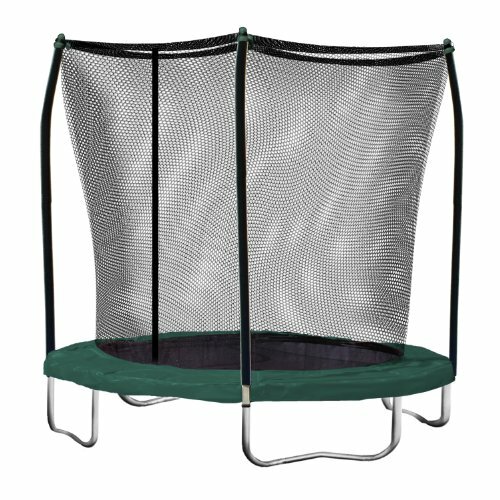 Best yet, this trampoline has all the safety features of a larger trampoline such as net enclosure and spring pad. All the full-sized trampoline feeling packed into a small package. Offers the perfect solution for smaller jumpers (up to 150 lbs) especially if space is limited. High Quality product at the right size. Q: Can this trampoline be left outside to the elements? Q: Online, I have seen the max weight 150 AND 175lbs, which is correct? Q: Does the trampoline fold up for storage?